How does a 13% projected power increase justify a 33% 50% increase in fracked methane delivered by a third new pipeline? And why isn’t FPL doing more with solar power in the Sunshine State? Updated 12 August 2014: Fixed 50% increase, which was so absurdly high that I didn’t believe it when I first wrote this. Yet 3/2 is a 50% increase. 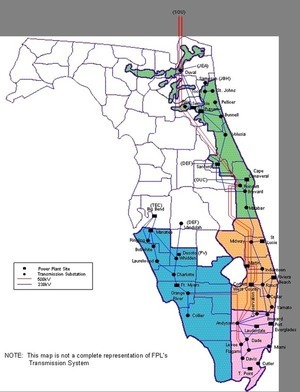 FPL submitted its 10-Year Power Plant Site Plan 2014-2023 to the Florida Public Service Commission in April 2014. The U.S. Environmental Protection Agency (EPA) was smart to ask FERC to get Sabal Trail Transmission and FPL to provide evidence for need for their huge yard-wide 100-foot-right of way fracked methane pipeline. Because FPL’s own numbers don’t support such a need. FPL also sought and received approval from the FPSC in 2008 to add 110 MW through three new FPL-owned solar facilities: one solar thermal facility and two photovoltaic (PV) facilities. One 25 MW PV facility began commercial operation in 2009. The remaining two solar facilities, a 10 MW PV facility and a 75 MW solar thermal steam generating facility, began commercial operation in 2010. The addition of these renewable energy facilities was made possible due to enabling legislation from the Florida Legislature in 2008. FPL remains strongly supportive of federal and/or state legislation that enables electric utilities to add renewable energy resources and authorize the utilities to recover appropriate costs for these resources. FPL is planning to introduce two new PV-based solar programs in 2014. These are discussed further in section III.F.4 of this chapter. Well, what does III.F.4 say about that? As part of its 2009 DSM Goals decision, the FPSC imposed a requirement for Florida’s investor-owned utilities to spend up to a set, not-to-exceed amount of money annually to facilitate demand side solar water heater and PV applications. FPL’s not-to-exceed amount of money for these applications is approximately $15.5 million per year through 2014. In regard to this direction, FPL received approval from the FPSC in 2011 to initiate a solar pilot portfolio that consists of three PV-based programs and three solar water heating-based programs, plus Conservation Research and Development. These programs are currently projected to be offered through 2014. FPL’s analyses of the results to-date from these programs shows that none of these programs are projected to be cost-effective using any of the three cost effectiveness screening tests used by the State of Florida. 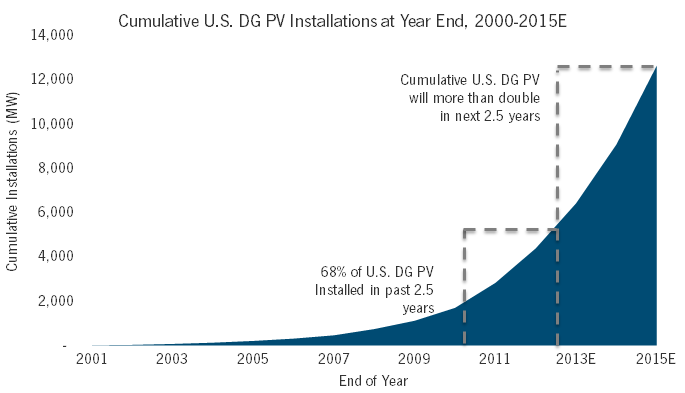 The fate of these solar programs, including their potential replacement with new solar initiatives, will be determined later in 2014 as part of the FPSC’s 2014 DSM Goals docket. FL PSC made FPL look at solar, but FPL managed to find it not cost effective. Meanwhile, a study from Stanford found all of Florida could be powered by 77.9% sun, 20% wind, 1% wave, 1% tide, and 0.1% hydro, with zero nuclear, coal, oil, or gas. 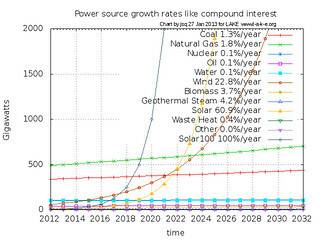 The last graph above is my projection using FERC’s own figures, which I made before I saw Wellinghoff’s projection. It matches: solar will win within a decade. If FPL won’t do solar, others will. That’s why Wall Street is talking about the “death spiral” of utilities that won’t do solar power. No useless fracked methane pipeline to help FPL deny the solar future. Let the sun rise on the Sunshine State.